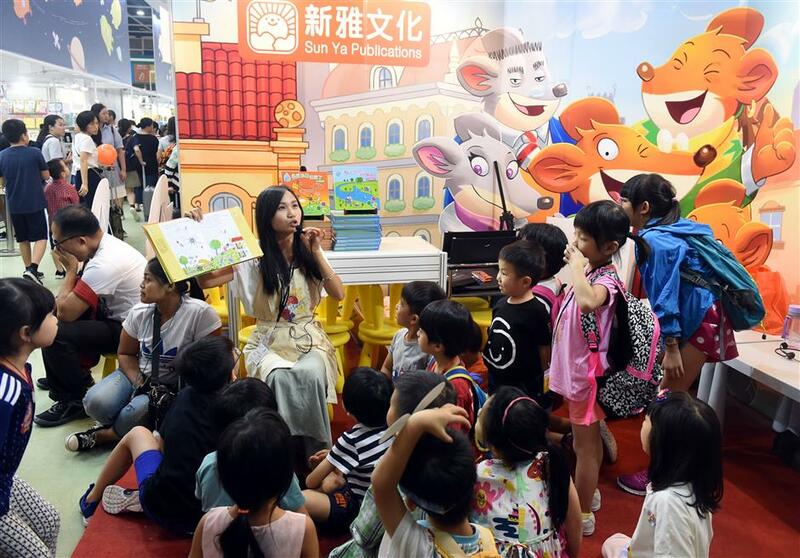 People's zest for reading are spurred in China's Hong Kong Special Administrative Region around this time of year when the Hong Kong Book Fair takes place in town. Children listen to a story at Hong Kong Book Fair in Hong Kong on July 18, 2018. Luggage bags, cash, and a floorplan in hand, everyone is geared up for a shopping spree at the annual literary fest, which attracted close to 1 million visitors last year. Middle school student Jolie Lam stuffed all her spoils in a 22-inch yellow suitcase after shopping for an hour at the fair. Wearing a contented smile, the 16-year-old local told Xinhua that she is going to have a substantial time reading this summer. Launched by the Hong Kong Trade Development Council on Wednesday, the 29th fair is themed "Romance Literature" to lead readers to appreciate love through reading, by showcasing works of local authors in an exhibition and a string of seminars. Meanwhile, parents and young readers are showing more of their passion for the search of cut-price books and items that can enhance learning. "We spent over HK$1,000 (US$127) for these books, mostly English fictions. It's cheaper to buy here," Lam's mother said, pointing at the suitcase filled with around 40 books, that reading has polished up her daughter's writing skills. Larissa Tong, 11, who is especially fond of teen novels, spent a few hundred dollars on her favorite titles. She agreed that most of the exhibitors are offering great deals, which is appealing. "Normally I prefer borrowing books from the library, but I think the book fair is a nice place (to do shopping) when you are looking for new releases," she said, adding that reading has broadened her range of vocabulary and imagination. As the HKSAR government has been putting more emphasis on the development in innovation and technology, exhibitors see it as a business opportunity and put on sale more STEM (Science, Technology, Engineering, Mathematics) education products. In "Children's Paradise," one of the 14 thematic zones of the fair, a smorgasbord of colorful, eye-catching educational toys and games, including robots, puzzles, building blocks, are presented. A mother of two toddlers, who wished to be named Leung, said that it is worth investing in toys and learning kits that can stimulate children's creativity and thinking in this era of information explosion. "Like most parents, I will do as much as I can to provide my kids with opportunities to acquire different kinds of knowledge, so they won't lag behind others of the same age," she said. Priscilla Wong, marketing manager from a local exhibitor selling STEM education products, told Xinhua that they expected a better sales this year as the atmosphere of innovation and technology in Hong Kong is improving. "In the past, parents would buy workbooks for their children, but now they aim for inspirational toys and games," Wong said. She said she noticed that the mindsets of parents are changing and children are expecting something more challenging at playtime. She added that people are more willing to spend money on educational toys, with some customers paying more than HK$4,000 for one single set of robotic arm at their booth. To combine learning with technology has become a trend. At a seminar in the fair, Natasha Leung, senior publishing manager at Pearson Hong Kong, talked about their collaboration with technology companies in adapting artificial intelligence to English learning. This collaboration has enabled the publisher to create a custom curricula that match each student's needs and ability and provide students with a virtual one-on-one tutor, which guide them on their learning path. Teachers in real life can then learn from the data about students' needs. A total of 680 exhibitors from all over the world participated in this year's fair, which runs until July 24.